As expected there was drama in the woods this weekend at the Waste Management Susquehannock Performance Trail Rally®. STPR isn’t a long rally, but it is no less exciting. With its wide nicely cambered and sweeping gravel roads, its many drivers’ favorite event. The flowing nature of the stages allows for high speeds and corner cutting, but drivers also have to watch out for rocks pulled out from those that cut the corners ahead of them. STPR also has a number of short Super Specials where cars go head to head. These are always a fan favorite as they provide easy viewing, and the head-to-head nature allows instant gratification of who is fastest. This year the excitement on day 1 started before the stages went live as concerns about weather was on everyone’s minds. Tire choice could be a big issue as thunderstorms were in the forecast and dark ominous clouds loomed on the horizon. As the first stage began it seemed like those clouds would hold off, at least for a while. 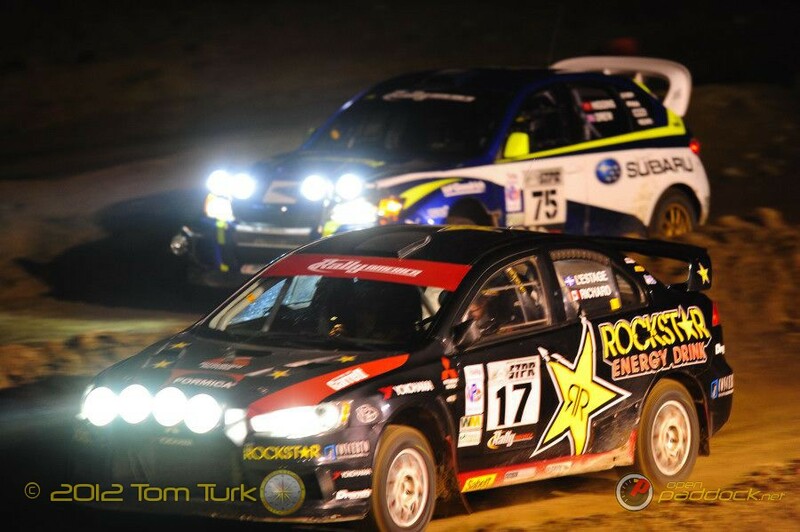 First off the line was Subaru Rally Team USA Puma factory team driver David Higgins and co-driver Craig Drew. Right away they had mechanical gremlins causing issues with their differential. 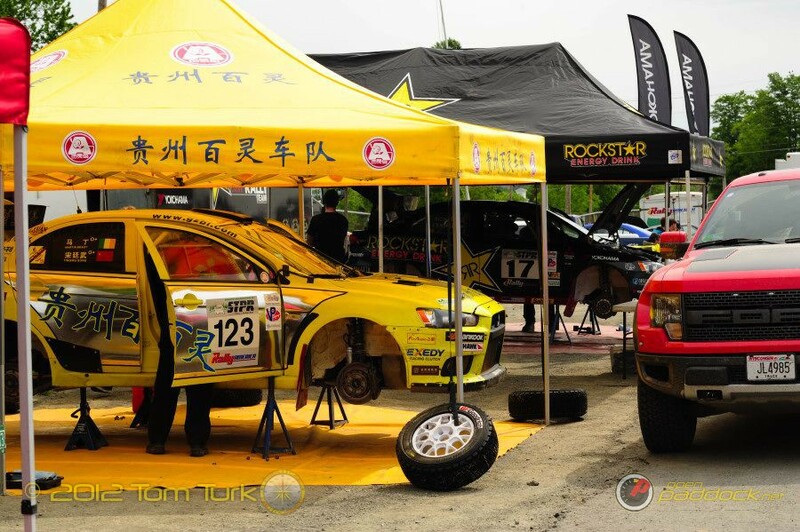 By the end of stage one they were back in 13th overall and a minute and a half behind leader Antoine L’Estage with co-driver Natalie Richard in their Rockstar Energy sponsored EvoX. Being the first stage, Higgins / Drew were going to have to limp through 2 more stages with power to only the two rear wheels before they made it back to service. Things weren’t so easy for L’Estage and Richard on the opening stages either as their EvoX was suffering overheating issues. Hot on their heels in second was newcomer to the Rally America series, Crazy Leo Urlichich with co-driver Carl Williamson. Even though Leo didn’t have any mechanical issues, L’Estage was still just a bit faster. So after the first 3 stages L’Estage / Richard was in first with a time of 24:33.4 minutes, followed by “Crazy Leo” / Williamson only 31.3 seconds behind. And wouldn’t you know it, now in 3rd of the open class was none other than FY Racing’s Adam Yeoman with co-driver Adam Schulze who podiumed at the last event at Oregon Trail. Even though they weren’t nearly as fast in their 2002 Subaru STi, their balanced approach seemed to stave off the gremlins and keep them in contention for a possible podium. In Super Production Ramana Lagemann was leading by 10.2 seconds over points leader Lauchlin O’Sullivan with Travis Hanson a scant 6.6 seconds behind O’Sullivan. Lagemann won STPR last year and could really put a dent in Hanson’s points battle with O’Sullivan. 2wd didn’t start out so well for normally dominant driver Chris Duplessis and co-driver Alex Kihurani. Although Duplessis was fast in his Ford Fiesta R2, it was hard to match the speed and power of Australians Will Orders and Toni Feaver in their fire breathing Nissan Silvia. So after the first loop of stages, Orders / Feaver lead followed by Duplessis / Kihurani in second 1:00.1 behind. Greenhouse / Johnson rounded out the top three 23.1 seconds behind Duplessis. So not only did Duplessis have to contend with the Aussies, but a new threat has emerged in regional driver Chris Greenhouse in their turbo charged 2003 Dodge Neon SRT4. Greenhouse has always been a fast and consistent driver in the past, but didn’t always have the machine to match his driving skills. This is apparently a new car for Greenhouse and he was definitely one to keep an eye on for the rest of the event. You might have wondered why I didn’t mention Andrew Comrie-Picard in his factory backed Scion XD. That’s because ACP and co-driver Jeremy Wimpy ripped a rear wheel off on stage 2 and DNF’d. The service park was insanely busy with SRT USA replacing differentials, Rockstar Energy fixing their overheating issues, and numerous other teams trying to get their machine band-aided up for the the next two stages. These were the Subaru Super Specials and were going to be run in reverse order. A few regional drivers got through the stage until Mother Nature decided to end things early. A massive thunder cloud moved overhead and lightning struck dangerously nearby. The officials called off SS4 and SS5 as not only as a tornado watch went into effect! As teams went for cover, the skies opened up in a downpour that would have made the stages better run in canoes rather than cars. With such a massive downpour, what would that mean for the stages on Saturday? Once again the tire choice gamble comes into play. As everyone took shelter, news spread of changes in the leader board. After an assessment of time penalties, “Crazy Leo” was now shown leading the rally! L’Estage and Orders were both given a 1 minute time penalty. L’Estage will need to make up 24 seconds to get back in the lead, and most exciting in 2wd Orders and Duplessis were now separated by only 0.1 seconds! How much is Chris willing to push his little Fiesta R2 the following day? Saturday, the longest and final day at STPR, the skies cleared up nicely however how dry were the roads in the forest? 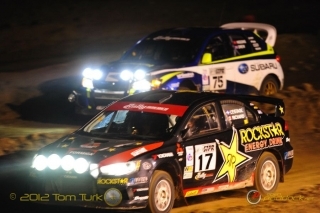 Higgins / Drew had to be somewhat frustrated as the canceled stages from the previous day meant less time to move back up the field in their repaired 2011 Subaru WRX STi, however the time penalty assessed to L’Estage helped close the gap. With his mechanical issues resolved, Higgins was on a charge! 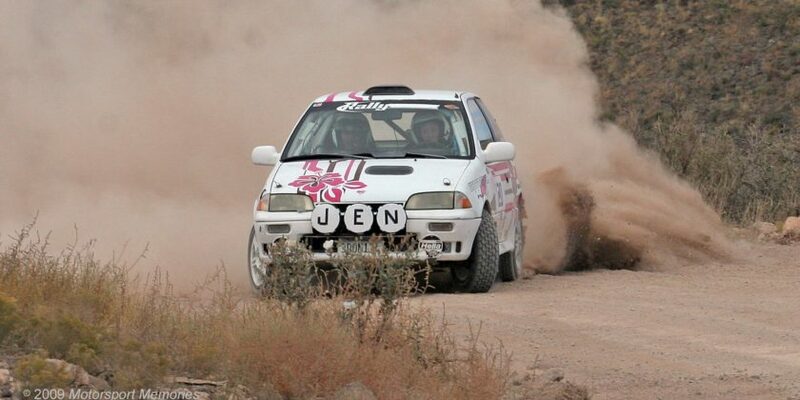 On the first stage of day 2 SS6, Higgins / Drew clawed back 6 positions in less than 10 miles! L’Estage was also on the move as his Evo X was running smoothly again and re-claimed first position and also had the fastest stage time. By the first service of the day L’Estage was back in first followed by Crazy Leo 8.8 seconds back, and Higgins was now up to 5th place overall gaining another two positions just over 2 minutes behind Leo. In SP, O’Sullivan moved ahead of Lagemann by the first service, with Hanson still in third well over a minute behind. In 2wd Orders stretched out his lead again, just over 30 seconds ahead of Duplessis with Greenhouse still holding on to third but dropping back over 2 minutes from the leader. Due to the accident, the rest of the runs through SS10 were cancelled as well as all of SS11. In yet another amazing feat, Higgins was able to move all the way up to third overall taking two more stage wins. He now sat just over a minute behind Crazy Leo and just over 2 minutes back overall. In SP O’Sullivan was able to stretch his lead over Lagemann to 20 seconds, and Hanson was unfortunately over two and a half minutes back in third. In 2wd reports were coming in of Summit rally driver Will Orders having an oil leak in his 400HP Nissan Silvia. The problem progressed to the point that he had electrical problems as well, and he had to stop. Chris Duplessis inherited the lead with Chris Greenhouse in second followed by the other Australian Summit driver Ross Allan. The third leg of the day would see the last chance for anyone to make a serious move. Higgins and Drew kept pushing the limit and Leo / Williamson just couldn’t hold them off any longer. By the time they reached service L’Estage was still firmly in first place and ahead by over a minute with only two short Super Specials to go. Amazingly Higgins was now into second place and over a minute ahead of Crazy Leo / Williamson. In Super Production everyone held position with O’Sullivan still leading followed by Lagemann and then Hanson. In 2wd, Ross Allan was spurred on by his teammate’s DNF, and overtook Chris Greenhouse for second. After the short Super Specials I’m sure L’Estage was breathing a sigh of relief as it was at the final Super Special last year that he lost to Higgins. This year was different though as, Antoine L’Estage and Natalie Richard took the win. 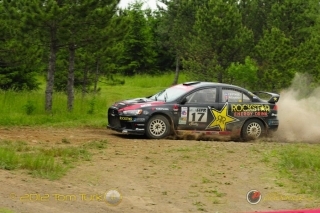 Their second win in just 8 days as they came hot off a Canadian event before arriving at STPR. David Higgins and Craig Drew finished second overall after a remarkable come-back climb through the order, and “Crazy Leo” Urlichich and Carl Williamson got on the podium yet again. Super Production ended as it did before the final service. Lauchlin O’Sullivan and Scott Putnam pulled off the win in their 2003 Mitsubishi Evo followed closely by Ramana Lagemann and Christine Beavis just 14.1 seconds back in their 2011 WRX STi. Travis Hanson was able to hold on to third in Super Production, nursing his car home 5 minutes behind the leader. In 2wd Chris Duplessis and Alex Kihurani were able to get the win in their recently built Fiesta R2. I read that they literally finished the car on Thursday just in time for tech inspection, and never made it to the Recce! Even so they still were plenty fast to stay well ahead of Ross and Scott Allan who claimed second more than two minutes back. Finally 3rd on the podium for 2wd was Chris Greenhouse in his turbo Neon SRT4. This was a very exciting event, even though I was watching it progress from the other side of the continent. Thanks again for all the photos provided by Tom Turk of Piratical Photography, @Piratical_Turk as well as all those on Twitter that kept me up to date with what was going on. You made me feel like I was there! 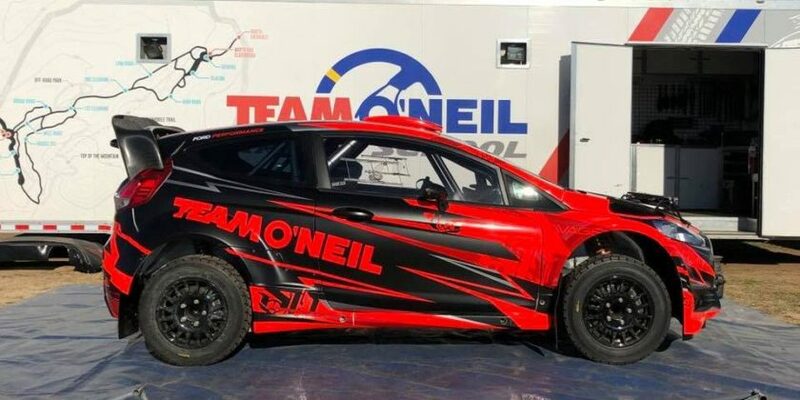 The next event is the New England Forest Rally, Round 5 of the Rally America Championship which takes place July 13-14 in Newry, Maine.